A butterflied leg of lamb is a great cut for the barbecue. A large leg will feed 6-8 people, with side dishes, and a smaller one will easily do 4 people. The nice thing about grilling a butterflied leg is that due to it’s being uneven in size and width you get a range of meat cooked to various levels of doneness. The thinner ends will appeal to people who like their lamb well done and the other sections will range from light pink to medium rare – there’s something to please everyone. I have the butcher butterfly the leg for me then trim it at home of any excess fat, but don’t take too much off as you don’t want the meat to dry out while it’s cooking. I also skewer the lamb together with some thin metal skewers to make it easier to turn and handle on the grill. A marinade of lemon juice, rosemary, garlic, Moroccan spices and a little melted clarified butter makes the lamb incredibly tender and full of flavour. 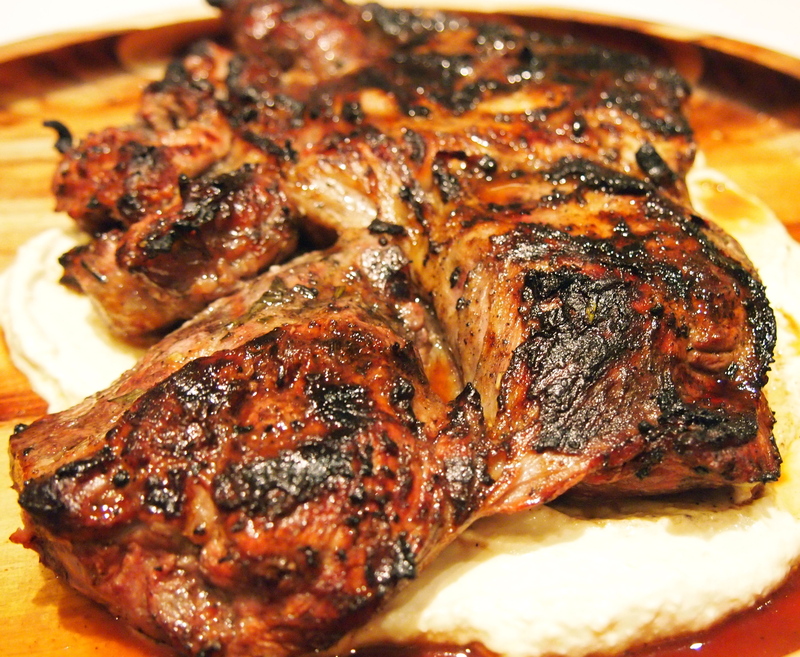 To enhance the Middle Eastern flavours in the lamb I like to rest it on a bed of hummus, as the lamb rests the juices meld with the hummus to create a wonderful sauce. I served this with a quinoa tabbouleh and some pita bread to sandwich the sliced lamb in. 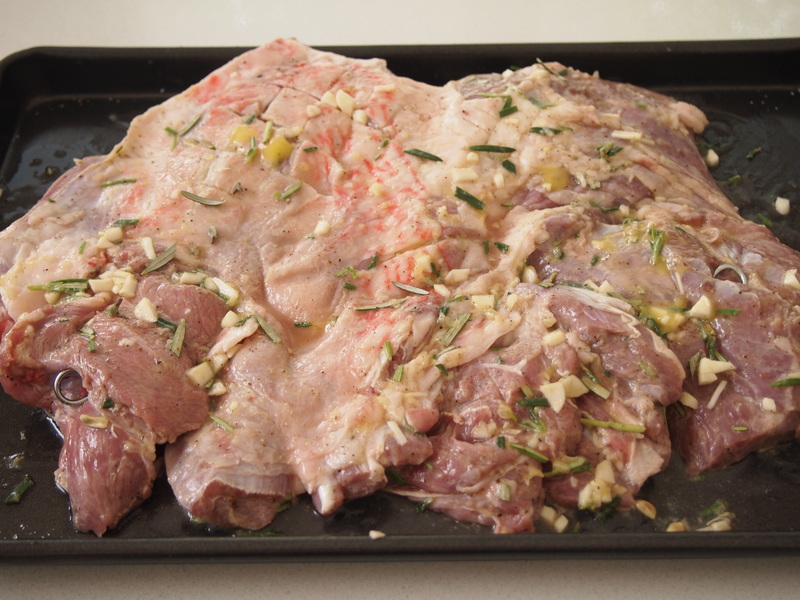 Lay the butterflied lamb on a large baking sheet and sprinkle very generously with salt and pepper on both sides. Put the lemon juice, garlic, rosemary, honey, spices and melted butter into a small bowl and mix well. Pour the mixture over the lamb and massage it into the lamb, making sure the marinade reaches all parts of the lamb on both sides. Cover the lamb with cling film and refrigerate for as long as you can, overnight would be ideal but even a couple of hours is fine. Light up your barbecue and bring the lamb to room temperature. Set your barbecue to a medium heat and when hot place the lamb fat side down first and let it sear for a few minutes then turn it over. It should take about 18 minutes in total to cook and you want to keep flipping and turning it every 4 minutes or so. While the lamb is cooking pour the hummus onto a large plater and spread it around. 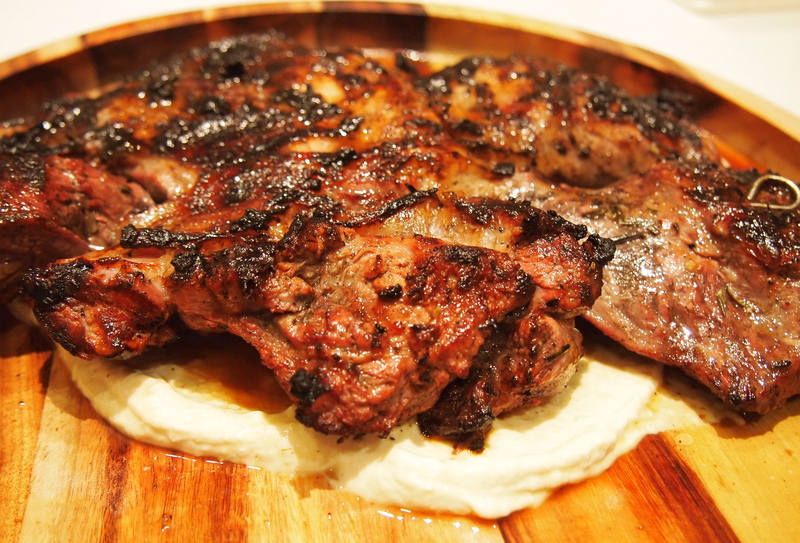 When the lamb is done, sit it on top of the hummus and cover with foil and let it rest for 10 minutes. Remove the foil and cut the lamb into thick slices and serve with the lamb juice soaked hummus, warm pita bread and tabbouleh. Thanks for the comment, Delaine and so glad you enjoyed the lamb!